Just a quick outfit post from the weekend. I'm trying to get pencil skirts out of my system before the weather gets too cold! See here how I styled this same pencil skirt back in the Spring. Also, note that this skirt is 22" long. The skirt in my last post was 25.5" long. It's amazing how much of a difference 3" makes. 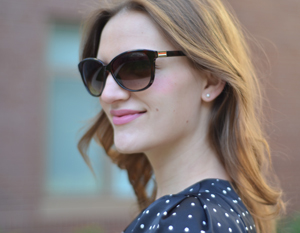 It's also amazing how much I am in love with this polka-dot scarf! I recently added this Tall J.Crew pencil skirt to my collection. I fell in love with the rich burgundy color and soft wool material. Perfect for fall! This is actually my first Tall skirt purchase from J.Crew. The regular-sized pencil skirts fit me well, but I've always been curious about the longer length. Verdict? Win! LENGTH: The Tall size is 25.5" long, which is two inches longer than the regular size. On me, the Tall length hits me right below the knee—well before widest part of my calf. This is the best spot for a longer pencil skirt to hit as it accentuates the curves of your calfs rather than making you look stumpy. I find that longer length pencil skirts look best when paired with heels (to balance out the proportions). MATERIAL: The double-serge wool has a weightier feel which is great for cooler weather and the skirt is fully lined to hide any imperfections. CUT: I went with a size 6T because I wanted a slim, but not tight fit. With pencil skirts that go below the knee, you should be able to move, sit, and bend, but the skirt shouldn't be too loose or else you'll look frumpy. Readers - Have you tried Tall J.Crew pencil skirts before? 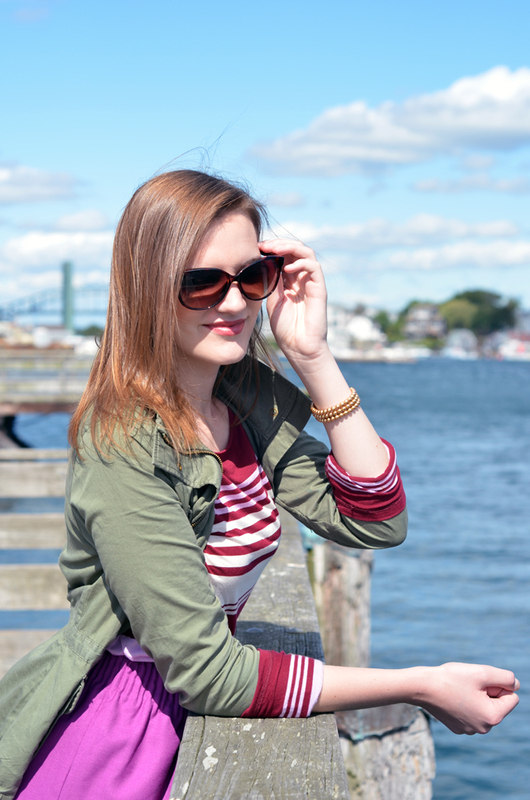 You can see from my September style obsessions post that I really am obsessed with burgundy and magenta! 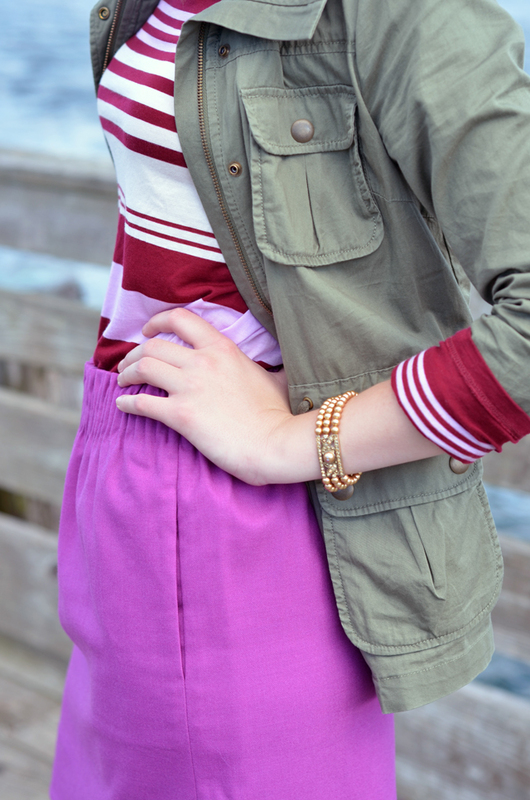 Here's an outfit I out together with my new striped shirt from J.Crew (on sale!). The shirt is a bit short lengthwise, but you'd never know it when it's tucked into a skirt. We had some interesting lighting going on tonight and were only able to snap a few shots of my outfit before the sun went down. Now, about the outfit. I'm not loving the J.Crew Memo dress on me. I really wanted to, but it just didn't seem to work. The problem is definitely the pleating around the hips. The pleating starts at my waist and ends at the largest part of my hips. When I walk, the dress starts to bunch and creates a bulge of fabric around the pleating. Unfortunately, not flattering. I will be returning this dress. A good sheath dress will show off curves, without being overly tight or uncomfortable to wear. This dress was the right length (just above the knees), the right size (4T) and the right color, but exaggerated my curves and was uncomfortable to wear. I think that this dress would be lovely on other tall ladies, but if you have larger hips like me, I would stay away from this dress! The good news is that the other tall J.Crew dress I purchased looks a lot better on me and you can expect an outfit post next week. One of my most recent obsessions is the pairing of a deep burgundy with a bright magenta. It's a great way to transition your summer pinks into fall. I'm absolutely loving the burgundy peplum top above which happens to be from the Topshop Tall section (for all you tall ladies!). Before we talk about the dress, I need to get something off of my chest. I broke down and bought a J.Crew knockoff bubble necklace! I know these necklaces have been all over the fashion blogs, but at $16, it is too perfect an accessory to pass by. Now, about the dress. I purchased it a few weeks ago from ASOS, thinking that it would be long enough to hit my knees (like the model here). Unfortunately it missed the mark by about two inches. The good news is that the overall fit is fine and the quality exceeded my expectations for a $29 dress. So far, I ended up wearing this dress on a networking cruise (you can see me on the dance floor here! ), where I paired it with a simple gold necklace.